Ice cream is rich in nutrients such as proteins of high biological value, carbohydrates, fats, minerals, mineral traces and vitamins. The majority of ice cream proteins originates in milk proteins which are of high biological value. Milk proteins provide our organism with amino acids that we cannot compose on our own. Carbohydrates originate in ice cream’s dulcifying materials and in milk’s lactose. Carbohydrate’s main function is production of energy which is used for various biological actions. As far as kids are concerned, researchers have found that lactose helps in absorption of calcium. Ice cream contains a big percentage of vitamins necessary for our organism’s normal running. 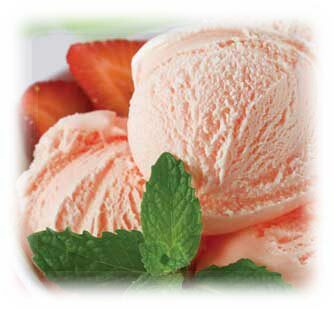 More particularly, vitamins A, D, E, vitamin C and vitamins B1, B2, B6, B12 can be found in ice cream. One of the most essential minerals contained in milk and consequently in ice cream is calcium. 99% of calcium can be found in bones and teeth. Milk- a basic ingredient of ice cream- is also considered as an excellent source of phosphorus. Iron, potassium and zinc are contained in milk, too.